The Chicago Veterinary Emergency and Specialty Center is a comprehensive veterinary specialty center that had its start in the Roscoe Village neighborhood of Chicago over 30 years ago. The ER, known as the Chicago Veterinary Emergency Services, opened its doors in 1978 at the current location. Over the years, the need for emergency care grew and the hospital was expanded. In the fall of 2009, it became open 24/7. The center, which is owned by 21 member hospitals, always envisioned making the hospital a specialty center as well. In 1999, the Animal Dermatology Center of Chicago joined the hospital and in 2004, Eye Care for Animals also opened a location at the hospital. 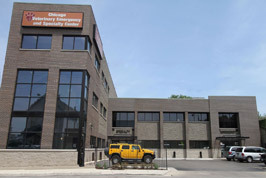 In the fall of 2010, the new 3 story specialty center addition opened and five new specialty practices, known collectively as the Chicago Veterinary Specialty Group, moved in. And in 2011, Fox Valley Veterinary Dentistry and Surgery also joined the center. The center was now a total of 18,500 square feet where veterinarians could refer their clients to receive specialty care in surgery, internal medicine, dermatology, dentistry, ophthalmology, imaging, neurology, cardiology and oncology, as well as 24/7 emergency care. The center provides Chicago’s pets with the most advanced emergency, medical and surgical care they deserve. Today, Chicago Veterinary Emergency and Specialty Center is proud to provide care for pets not only in Chicago, but from all surrounding counties and states. Because of the vision of a few veterinarians many years ago, CVESC and its 120 employees have become your regular veterinarian’s partner in maintaining the health of your pet.